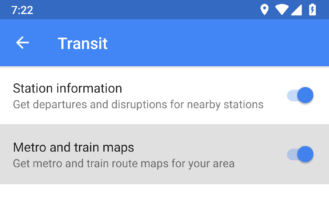 Google Maps has been making huge leaps at improving mass transit features over the last couple of years with new and improved features like step-by-step navigation through stops and updated train schedules. It looks like the latest addition may be a readily accessible map of local transit routes. A few months ago, the first clue popped up in a single line of text, though it was followed by minor additions in subsequent updates. As of v9.75, it looks like that feature is going live, and it's taking a new and unexpected form. There's a new notification setting in the Transit group that allows you to disable an option to get metro and train maps for your area. Basically, if you're close to mass transit, you'll be able to check your notifications and instantly access a map of those local routes. 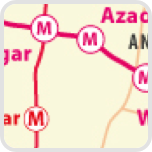 The notifications offer to show the nearby map and suggest it will help you plan your trip. You can obviously disable these notifications manually, but there's also an option to turn them off after receiving such a notification. But there's also a very important and thoughtful twist on this: You can also ban notifications for specific stations. 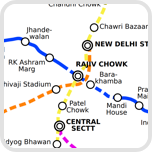 That's important because you might live or regularly pass by some stations that are already very familiar to you, but still want to take advantage of these notifications while venturing further away from home or to another city. I don't live in an area with mass transit, but if any readers see this going live, we'd love to get some screenshots of the notifications and the maps that are shown with them! On a small note, there's a possibility this is initially being tested in India at this time, specifically in the cities of Mumbai and Delhi. This is based on a few images that were added with the specific cities in the file names. 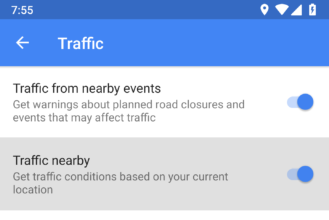 It's obviously not really a new feature, we've seen this in various incarnations over time, but there's now a setting to have nearby traffic notifications. We've seen these notifications from Google Maps and the Google app before, plus various in-app displays for that information. Nevertheless, if you don't want to see this notification, there's now a switch to turn it off located under the Traffic section in Notifications. In light of growing issues with overcrowding and environmental conservation, lots of cities have seen an explosion of bicycle-sharing services and programs. Google may be working to integrate sharing services so it can report on availability at each location. The purpose is obvious – potential riders don't want to walk out of their way to a location only to find that all of the bikes have been taken. The new strings were written out just to show how many bikes are available out of a total number. Many of these services offer their own apps to make it easy for frequent riders to check on availability, like Indego in Philadelphia, but there's obviously a lot to be said for getting all of that data into Google Maps so users don't have to download a separate app. I hate to even mention this one, given that it's the drum that never stops banging, but there are two new lines related to speed limits. These aren't really that special since there are already two similar lines, but I figured people would want to know about any hint of activity on this topic. Speed limits have actually been functional for well over a year, but Google previously confirmed they would only show up in limited areas. At the time, the only regions covered by speed limits were the San Francisco Bay Area in California and Rio de Janeiro, Brazil. Perhaps it's worth keeping an eye open for any possible changes, but try not to get too disappointed if this isn't a sign of a huge rollout of speed limits quite yet. Some new strings related to an "LG perk" have been added with the latest update to the Google Maps app. The text mentions claim codes, bookings, and shows that ticket details will be sent to a specific email address. Unfortunately, there's not much more to go on than this. It seems safe to surmise that the perk isn't for discounted hotel rooms since there are tickets involved. Likewise, most other types of travel seem like an unlikely pairing. Perhaps the perks will be for access to free or discounted services, concert tickets, or something else along those lines. It's also possible some of these lines are used for one perk while others belong to a different perk. Correction: Sometimes the brain fails at the most obvious of details, and that totally just happened here. I originally thought LG likely referenced the company, but was reminded that it probably stands for Local Guides. With that said, even though I agree it's unlikely, we shouldn't rule out the possibility this is a perk for LG customers rather than Local Guides.